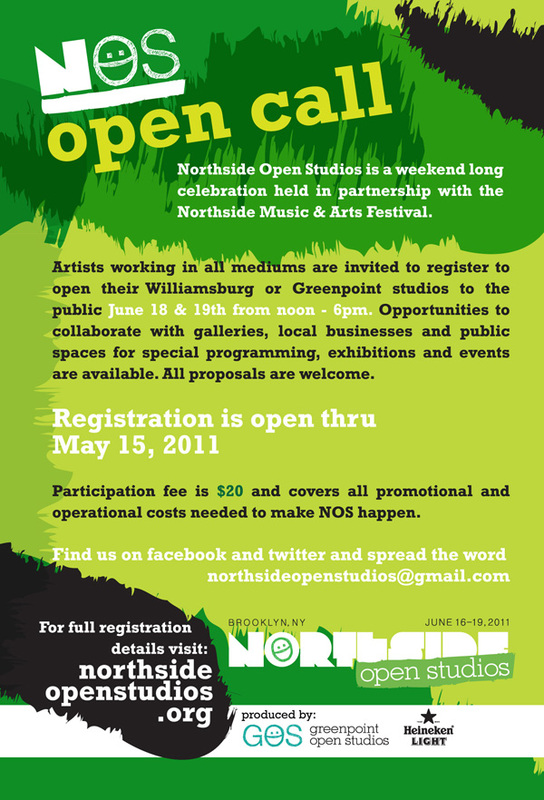 Greenpoint Open Studios is teaming up with L magazine’s Northside Festival this year to bring you NORTHSIDE OPEN STUDIOS, a four day event celebrating a burgeoning art scene in Greenpoint and Williamsburg, Brooklyn. As artist studios and exhibition spaces continue to emerge in the neighborhood we hope to facilitate the growth of a thriving art community. Registration is now OPEN and we encourage artists working in all mediums to register online by May 15th. There is a Meet & Greet on April 26th 7:30pm at Brooklyn Brewery located at 79 North 11th Street and we will discuss registration, programming, and any questions. It is very important that artists join us in the meeting and get to know each other and learn about NOS over a complimentary free beer! Please help us spread the word, our goal is to reach 300 participating artists who can take advantage of the 10,000 brochure copies that will be widely printed and distributed throghout brooklyn, not to mention a vast opportunity for viewership and attendance. Follow us on twitter, like us on Facebook, and share the open call invite. Feel free to also post any announcements and listings on our page, whether it’s an upcoming show or an available studio down the hall. April 26, 2011 (that’s today!) starting at 7:30 p.m.